Olympus’s iconic PEN series of 35mm film cameras, launched in the 1960’s, has been given a new lease of life in the digital era with the renowned Japanese manufacturer reviving the stylish and retro design in its PEN series of mirrrorless hybrid cameras. The latest offering in the now well-established PEN range is the new Olympus PEN-F, which scores above the older, but still available, Olympus PEN E-P5, to become the new flagship option in the PEN lineup. With a $1199 body-only price tag, the PEN-F also becomes the most expensive Olympus hybrid camera yet, ahead of the $1099 OM-D E-M1 and OM-D E-M5 Mark II. Built around a 20.3Mp Live MOS Micro-Four-Thirds (MFT) sensor, the PEN-F also becomes Olympus’s highest-resolution hybrid, as the manufacturer moves away from the 16Mp chips used up until now. Combining both style and substance, the PEN-F boasts the cool retro PEN aesthetic, together with a set of features incredibly similar to that of the OM-D E-M5 Mark II. These include Olympus’s 5-stop sensor-shift stabilization system, which corrects camera shake across 5 axes, as well as continuous shooting at 10fps without autofocus tracking or 5fps with. Autofocus is an 81-point contrast detect system featuring AF tracking, face detection, and illumination assist to help in low light; however, there’s no phase detection AF on the PEN-F. Maximum ISO sensitivity has been increased to 25,600, with a LOW ISO setting of around 80 ISO at the other end of the range. For high-speed photography, the PEN-F offers a fast 1/8000-second top standard shutter speed, as well as an optional 1/16000 super-fast electronic shutter mode. The higher-resolution 20.3Mp chip has enabled Olympus to further increase the resolution of its high-resolution shot mode, which can now capture 80Mp RAW files or 50Mp JPEGs on the PEN-F. Shooting 8 exposures in quick succession and shifting the sensor slightly between each shot using the 5-axis sensor shift mechanism, Olympus’s high-resolution shot mode combines the 8 exposures together to output a higher-resolution file. Achieving an overall DxOMark Sensor score of 74 points, the PEN-F becomes the top-ranked Olympus sensor in our database. 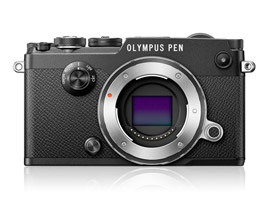 Sitting just ahead of the Olympus OM-D series cameras with 73 points, and its predecessor the E-P5 with 72 points, the PEN-F’s higher-resolution 20.3Mp sensor shows some progress in image quality performance for Olympus digital cameras. That said, the increased resolution hasn’t had a significant impact on sensor scores, with results in the Portrait, Landscape and Sports categories comparable to those of the lower-resolution Olympus hybrid models in the top 5. So compared to the best-performing hybrid sensors in similarly-priced Sony and Samsung hybrid cameras, the Olympus Pen-F remains a little behind, which we’ll investigate in more detail below. The PEN-F recorded its best scores at base ISO sensitivity, which we measured at 91 ISO for the PEN-F’s LOW ISO setting. We then measured the manufacturer’s stated ISO 200 sensitivity setting, which turned out to be ISO 91 as well, meaning that there appears to be no difference in sensitivity between the LOW ISO and ISO 200 settings on the PEN-F. This is important to note when analyzing the scores for dynamic range and color, which, as usual, we’ve plotted as corresponding to the sensor’s measured ISO. The PEN-F’s headline dynamic range score of 12.3 EV is recorded at the measured ISO 91 setting, declining just slightly to 11.4 EV at measured ISO 362 (manufacturer ISO 800). At higher sensitivities, dynamic range reduces in a linear fashion, offering good results just under 10 EV at measured ISO 1428 (manufacture ISO 3200), down to a low of 6.9 EV at measured ISO 11,200 (manufacturer ISO 25,600). The PEN-F records the same 23.1-bit color depth at measured ISO 180 (manufacturer 400) as it does at its LOW ISO setting. As with dynamic range, color sensitivity holds up slightly better at lower ISOs up to measured ISO 723 (manufacturer 1600), offering good color depth of 21 bits at this setting. With all recent Olympus hybrid sensor scores hovering around the low- to mid-70’s, the new 20.3Mp chip in the PEN-F offers very similar metrics to the lower-resolution 16Mp PEN E-PL5 and OM-D E-M10 Mark II. Of course, the PEN-F’s higher-resolution sensor captures more detailed files, but results for color sensitivity, dynamic range, and ISO are very comparable at base ISO. As sensitivity increases, dynamic range also remains fairly consistent across these three Olympus hybrid sensors. Color sensitivity has been improved on the PEN-F, however, particularly at higher ISO settings, where between manufacturer ISO 1600 and 25,600, the new sensor offers more than a one-stop advantage over the OM-D E-M10 Mark II and Pen E-PL5. With Panasonic and Olympus jointly developing MFT sensors, it is very likely the PEN-F’s new 20.3Mp sensor is essentially the same unit used in the 20.3Mp GX8. This is borne out in the overall scores, which are unsurprisingly very similar. Dynamic range results are very comparable at all ISO sensitivities between the PEN-F and GX8; but again, Olympus has managed to improve color sensitivity for the PEN-F at higher ISO sensitivities, which show that one-stop advantage in color depth from manufacturer ISO 1600 onwards. The physically larger APS-C and higher-resolution sensors in the Sony A6300 and Samsung NX1 hybrid cameras offer a slight advantage in image quality across all sensor metrics compared to the PEN-F’s smaller MFT sensor. At base ISO, the A6300 and NX1 offer greater color depth of 24.4 and 24.2 bits, respectively, compared to the PEN-F’s 23.1 bits at measured ISO 180 (manufacturer 400). Color sensitivity results appear much closer as sensitivity is increased, but taking into account the PEN-F’s ISO measurement discrepancies, the PEN-F’s color depth remains around one stop lower than the A6300 and NX1 between ISO 200 and 12,800. For dynamic range, the advantage of 1+ stop that the A6300 offers at base ISO is broadly maintained as sensitivity increases, and although results around manufacturer ISO 400 are closer, the A6300 improves against the PEN-F as sensitivity increases further. At higher sensitivities, the A6300 offers roughly the same levels of dynamic range around 8 EV at manufacturer ISO 25,6000 as the PEN-F at ISO 12,800. Taking into account the measured ISO sensitivities at which these dynamic range results were achieved, however, the A6300 offers closer to a two-stop advantage, recording 7.7 EV at measured ISO 18,421 compared to the PEN-F’s 7.9 EV at measured ISO 5680. The Samsung NX1’s dynamic range advantage at lower ISO sensitivities holds up only until around manufacturer ISO 200. Between ISO 400 and 12,800, the results appear much closer aligned; but again, with scores plotted against the measured ISO sensitivities, the NX1 actually boasts a one-stop advantage, as its measured ISO values are much closer to those the manufacturer states. For the style-conscious, trendy hipsters, or photographers reminiscing about the aesthetics and controls of film cameras, the 1960’s retro styling of the PEN-F will have great appeal. It’s a lovely looking camera; it’s not style over substance, however: packing a new 20.3Mp sensor, 5-stop image stabilization, ART filters for creative in-camera effects, and a 80Mp high-resolution shot mode, there’s plenty under the hood for high-quality digital photography. Not only the highest resolution Olympus sensor to date, the PEN-F also ranks as the highest scoring Olympus hybrid on our database. Improvements over previous Olympus 16Mp sensors are modest, but greater color depth at higher sensitivities is a positive step that will be welcomed by many photographers. 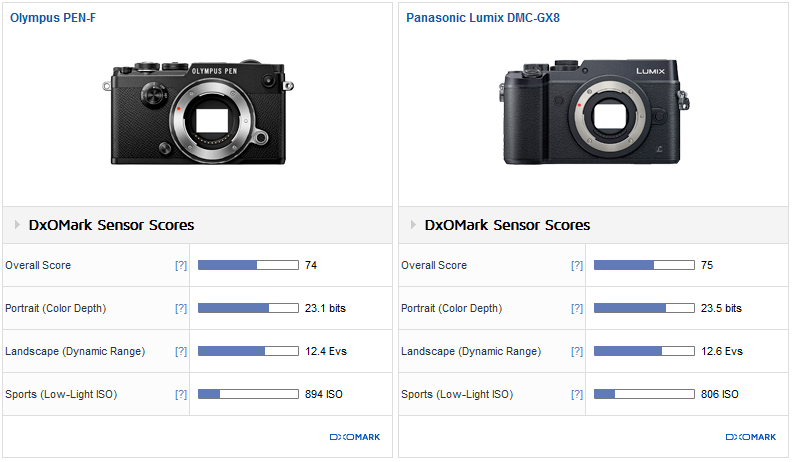 DxOMark scores for MFT sensors have always trailed a little behind the larger APS-C chips used by Sony and Samsung, and that remains the case with Olympus latest model. Positioning the PEN-F with an initial $1,199 body only price tag, Olympus are going toe to toe with this competition, so it’s only fair to make direct comparisons and highlight that better RAW image quality available in the hybrid market for that sort of money. Perhaps all of that rather misses the point of the Olympus PEN-F however, which offers something different in the market for those photographers after a more aesthetically pleasing camera that boasts easy to use body mount dials and controls, in a well-manufactured robust unit with great design.